The Goldstar WG1005R is a single room air conditioner that fits inside a standard-sized window. The air conditioner features a built-in thermostat and a washable filter. It is portable and can be easily moved in to and out of a window depending on the season. The Goldstar WG1005R features both an air conditioner and fan. Control the cooling settings by adjusting the dials on the front of the air conditioning unit. 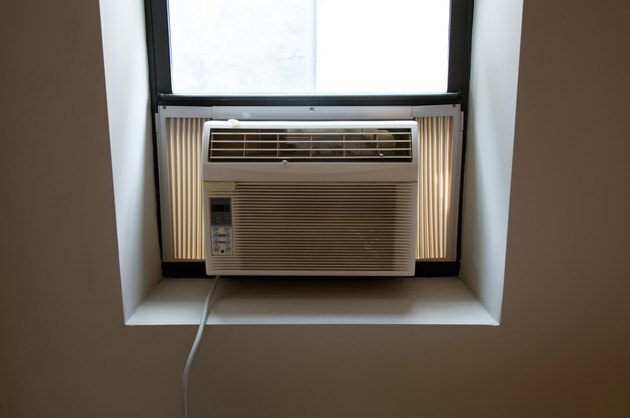 The Goldstar air conditioner fits inside a standard-sized window. Turn the operation dial clockwise to a fan or cool setting: high cool, medium cool, low cool, low fan or medium fan. Both fan modes help circulate air into the room but do not cool the room. Turn the thermostat dial clockwise to cool the room. Turn the dial all the way to the right between 7 and 9 for greater cooling. The higher the number on the thermostat, the greater the cooling. Wait 10 minutes before adjusting the temperature. This gives the air conditioner time to work. Wait at least three minutes before moving the operation dial from cooling to fan to cooling again.